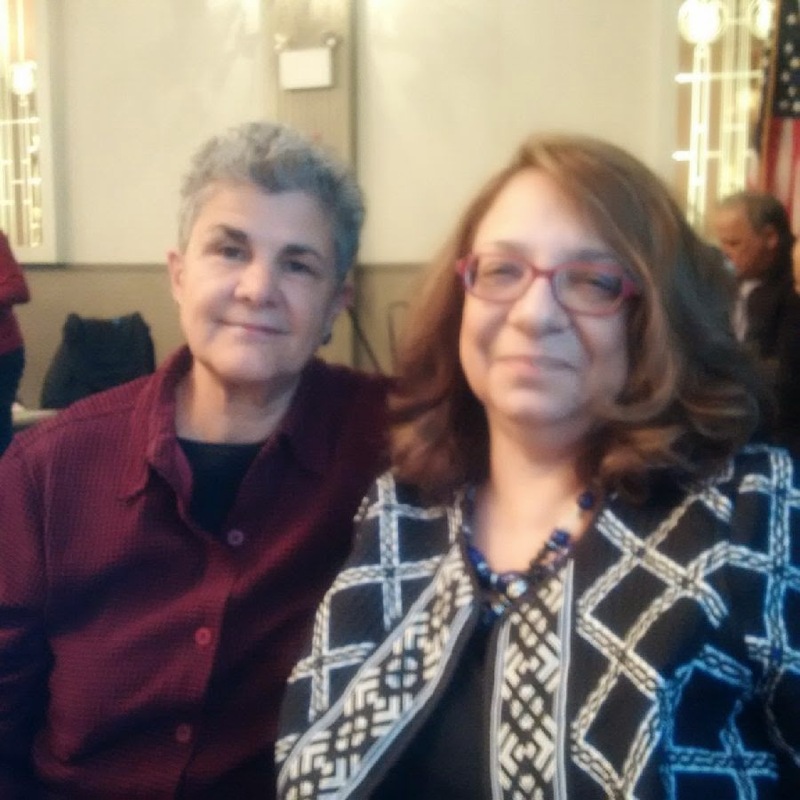 Live from New York, it's Greek Genealogy! 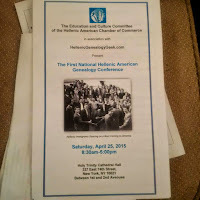 Taking our lunch break at the First National Hellenic American Genealogical Conference. The speakers are awesome, including Georgia Stryker Keilman, the founder of HellenicGenealogyGeek.com (in the picture below with me). We have heard from the author of "Greek Americans: Struggle and Success" and the Greek-American Chief Archivist of Ellis Island as well as Georgia and Professor Louis Katsos, chief organizer. Hooking up here with others who share my passion/obsession and looking forward to more speakers to come -- including "Records Available from the General State Archives of Greece" located in Psychiko, Athens. You can check it out at www.gak.gr. It's in both Greek and English -- everything from voting and ecclesiastical records to who received medals in the war (s) for independence. If your great-great-great grandfather got one of those medals, please let us know about it. Meanwhile, today we observe the 100th Anniversary of the Armenian Genocide AND the bigger picture of pogroms against the Greek Christians and Assyrians of those times -- something that we can NEVER forget. Zoi se mas. Planning my June trip to Greece now...And with today being my aunt Liberty Sarris' 88th birthday, I was thinking of a truly remarkable trip to Greece that we took in 1962 during the summer before my senior year at Stagg High. * That rather amazing (in retrospect) 2-month escapade is documented in my little red "Trip Abroad" diary -- as my first ever trip by plane and topped off by an overnight Paris stopover on the return. In 1962! 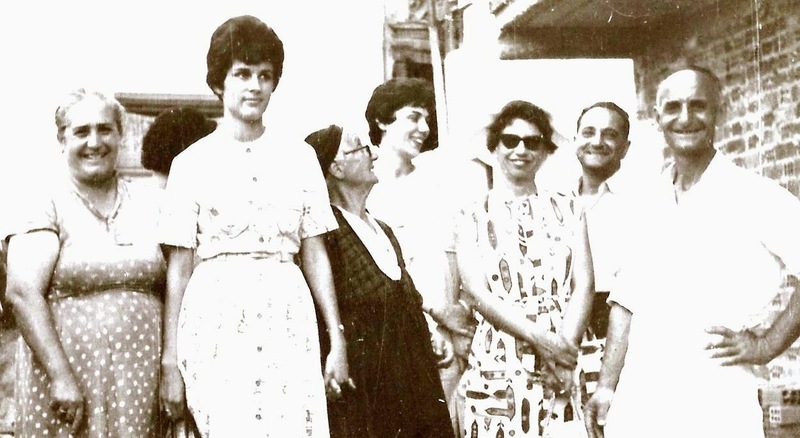 It all began with an invitation to visit the Harry Theocharides Family, good friends who had recently gone back to the American Farm School in Thessaloniki where his father had once taught. Harry typically pulled out all the stops to show us a good time, to see everybody and everything possible...But first Athens, where we were greeted at the airport by my grandmother's wonderful sister Anna, who lived in Piraeus and bore such a resemblance to Yiayia Sarris that I did a double-take. "How did Yiayia get here?" 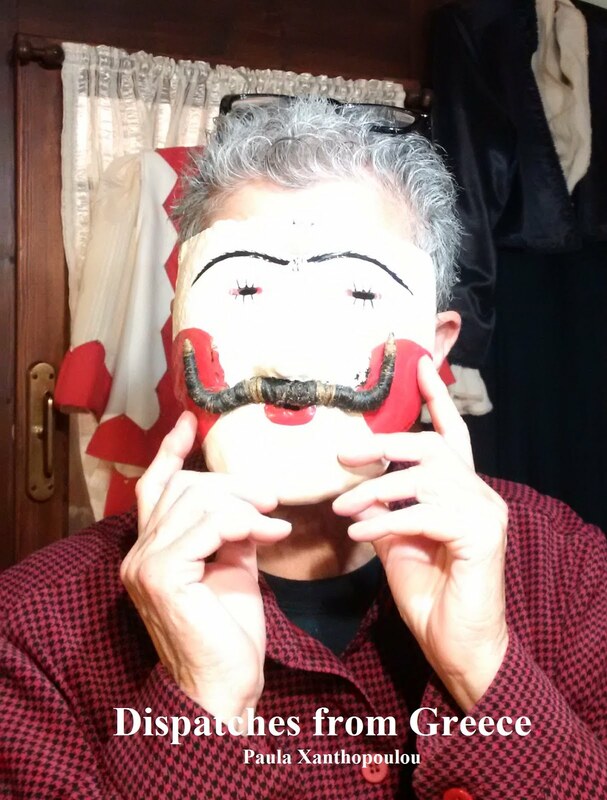 We then spent about 3 weeks exploring Thessaloniki and therabouts, including my Dad's historic Naousa -- where I met Yiayia Xanttopulos' elderly aunt Sultana Lalas and other relatives that I would see many times over the years, especially during Carnival Season. Later we visited Yiayia Sarris' breath-taking Koroni in the Peloponnesos, flying first to Kalamata on a tiny Olympic commuter plane and going the rest of the way by taxi eating "free grapes on the road." There I obediently slurped a raw sea urchin that Cousin Thanassi pulled off rocks in the Ionian Sea not far from the family ktima. My aunt and I were both startled and honored to find a brand-new pink toilet in our uncle's out-house that had no plumbing attached to it. And we slept in a room with somewhat unnerving portraits of mustachioed ancestors lining the walls, an experience I would repeat with my brother Bill in 1977. The trip was not without challenges common for the times -- especially during a 10-day stay on Spetses, an island not far from Athens that did not allow cars and where the Theocharides had a summer gig. And where our odyssey turned into a little bit of a nightmare. I got sick for the second time, with a 105.2 temperature that took 6 days to normalize. It was quite a scene: "I was scared by the way everyone was acting." My aunt must have wondered what she'd gotten herself into. On August 15th (Tis Panayias), I celebrated w/a motorcycle ride...and weighed in at 113 lbs. after what was later diagnosed as para-typhoid. And I love my aunt for taking me on that trip and to many others places over the years. On this coming trip, my niece Rachel will be with me on the Kyparissi leg, continuing our own family tradition...Happy Birthday, Thea! *In her heyday, my aunt was the ubiquitous Registrar at Stagg Senior High School, having started out at Stockton High. She retired in 1989 with many kudos for 42 years of "Outstanding and Exemplary Service" (followed by about 10 more years of pinch-hitting when the Stockton Unified School District called on her). Had been thinking about cemeteries for historical purposes when I got the news of Jerry Lucas' passing. That was a big blow to my Stockton memory bank. 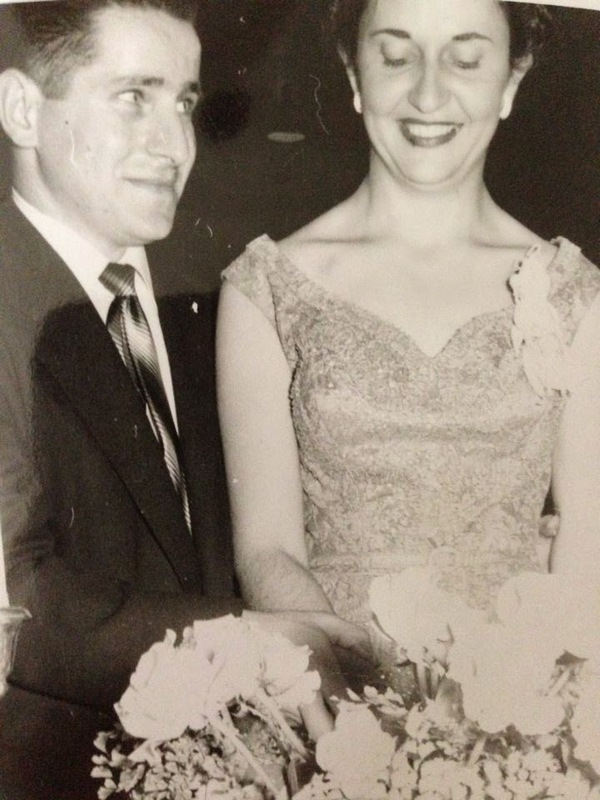 I cannot remember not knowing Jerry, the really nice guy who married my Uncle Jim Hlebakos' sister Harriett. He was a fixture in our lives -- especially as a shoe repair guy par excellence (following in his father Dimitri's footsteps), who had a shop at 936 N.Yosemite near the S&G Market. And he was one of the last Stockton Naousa links of his generation. It's up to Jim,* Helen, Dean and Leah to keep that fire burning. I miss too many Stockton funerals, but try to make up for it with extended visits to Stockton Rural Cemetery when I can -- making the rounds to my parents, many relatives, and others like my mom's best buddies Anthe Faipeas and Oly Spanos. They will not be forgotten, just as we should not forget the many Greek pioneers buried there since the 1920's. 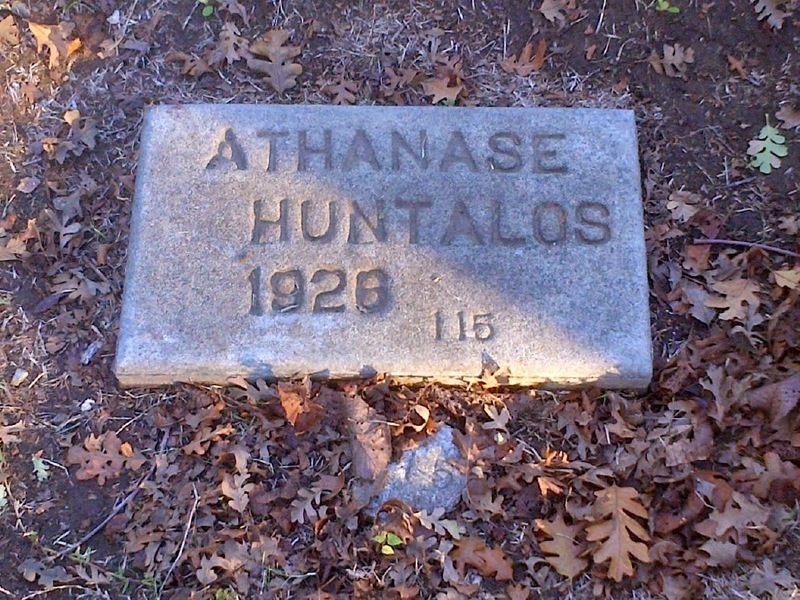 Anyone wanting to know more about the history of Greeks in the Stockton area need only take a long walk around the place to get a sense of that, bolstered by concrete names/dates (including many infants). Jerry has gone to Cherokee Memorial Park in Lodi, where he was born. I have not been to that cemetery, yet. "Cemetery mapping" (charts/photos) by outside groups is a growing trend for both keeping historical records and posting that info online so that family members and genealogists can find people in the future. 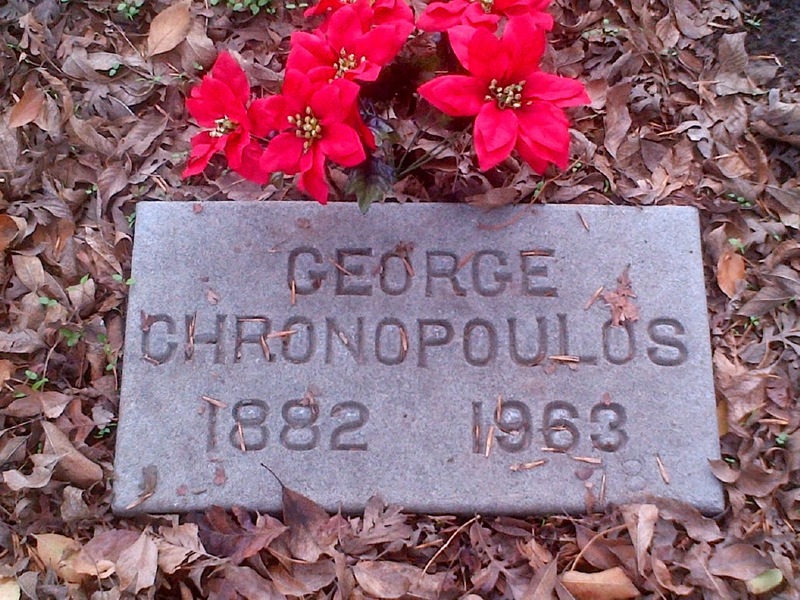 In that vein, I recently posted the grave of George Chronopoulos on Findagrave.com. He was known to us simply as Yiorghi, someone I visited with my Yiayia Sarris at his dilapidated, creepy/mysterious, and now non-existent homestead on Oregon Avenue when that area was still "rural" so to speak. 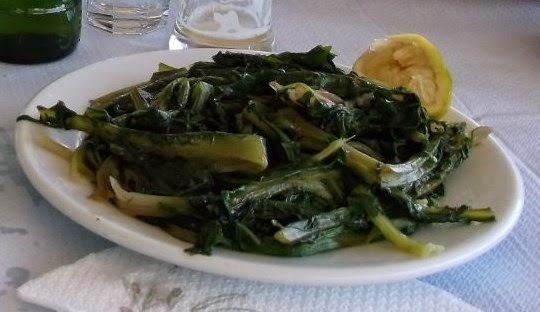 Yiorghi was from Koroni according to my Aunt Libby, and Yiayia drove him to the grocery store almost weekly. And if I happened to go along, I would lurk along the grocery aisles until he me called me over to give me a quarter (a pretty big deal in those days). He also had a little farm in the back of his property and would reward my grandmother with bunches of pigeons that she baked individually in tin foil with plenty of garlic. I do not, alas, have any photos of Yiorghi -- but can still conjure up a stocky figure in denim overalls, grey shirt, work boots and jaunty hat sitting in the back of Yiayia's two-toned Plymouth. 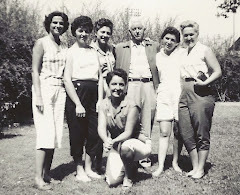 George Chronopoulos was a nice man. And maybe some day, someone from his family will be looking for him, see my submission, and send me an email. That would really be something...but today I'm thinking about Jerry Lucas. Zoi se mas. *As noted several times before on this blog, Jim Lucas is the amazing leader of the San Francisco Greek Historical Society.